Subaru Review: The all-wheel drive Subaru Outback has a lot of new competitors now that the crossover market has heated up. It has a very car-like ride but also has some of the best features of SUVs, like excellent traction on slick roads and a roomy cargo area in back. There was a time when the Subaru Outback was unique. Back in the mid 1990s, when campy ads featured an Australian pitchman touting the all-wheel drive "sport utility wagon," there wasn't anything quite like the Outback. It was a car-based vehicle, but it had a slightly higher ride height and off-road capability of a small SUV. Today, we don't call those vehicles "sport utility wagons." We call them crossovers, and they're everywhere. Still, like wildlife on a remote island, the Outback has stayed true to its roots while the rest of the automotive world has evolved in a different way. Crossovers have generally become bigger, more bloated and more SUV-like, while the spunky Subaru has stayed as nimble and wagon-like as ever. Today's Outback is far more car-like than most of its crossover competitors. It has a comfortable, compliant ride, crisp steering and solid brakes. Overall, this Japanese car with an Australian name has an oddly German feel to it. It's so solid, so robust that you wonder whether it ought to have a higher price and a three-pointed star on the hood. While it doesn't have all the luxuries of a Mercedes, the Outback has definitely moved upmarket in recent years. The version I tested came with a touch-screen navigation system, leather seats and a terrific Harman Kardon stereo system for around $31,000. The base Outback starts around $22,000. There's one noticeable change to the 2009 Outback. Now every model get's Subaru's Vehicle Dynamics Control as standard equipment, which is designed to keep the car moving in the direction you steer it, particularly on slippery roads. That's important, because a big portion of Subaru's sales are to people who need to drive on ice and snow. You see a lot more Subarus in the North and mountain states than you do in the South. 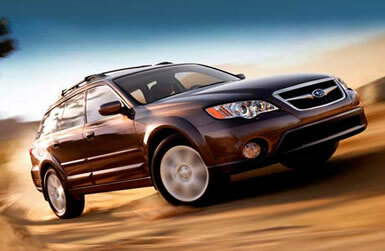 Even if you live in Miami, the Outback's standard all-wheel drive setup keeps the vehicle firmly planted on the road. Its chassis feels like it could handle a huge amount of power, and it's almost impossible to get the tires to lose traction on dry roads. It's a comforting feeling. Subaru offers five different versions of the Outback. The 2.5i comes in a base version, Special Edition and Limited, all of which have a 2.5-liter four-cylinder engine that makes 170 horsepower. The 2.5XT Limited adds a turbocharger to make 243 horsepower, and the 3.0R Limited has a six-cylinder engine that makes 245 horsepower. What was tested? The 2009 Subaru Outback 2.5i Limited with a base price of $30,495. Options on the test car: Rear cargo net $51. Total MSRP price as tested including a $665 destination charge: $31,211. Why avoid it? Some of its crossover competitors are more roomy and powerful. Why buy it? It drives more like a car than most crossovers. It also feels remarkably solid and comes with Subaru's excellent all-wheel drive. Bottom Line: If you like Subarus, you'll like the Outback. Even though it has more competitors as the crossover market has matured, there's still nothing that looks and feels the same as an Outback.